Super Monkey Ball: Banana Splitz on PlayStation Vita Hands-On Impressions. SEGA's zany primate-populated pseudo-puzzle platformer felt like a breath of fresh air when it debuted on the Nintendo GameCube ten years ago, transforming a basic gameplay concept into something cute and, most importantly, memorable. But an overzealous SEGA was quick to oversaturate the wafer-thin concept, recklessly releasing too many entries in the series, and ultimately condemning AiAi and crew to the closet — destined only to be dusted off for for platform launches and smartphone ports. 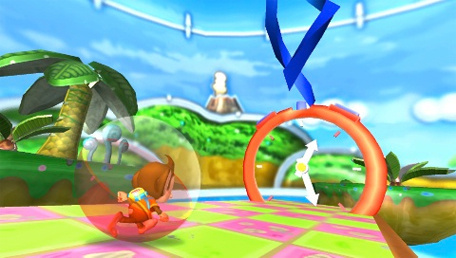 Super Monkey Ball: Banana Splitz on the PlayStation Vita is the most recent outing for the sphere encased apes. And unsurprisingly it feels as familiar as a Cliff Richard commercial on Christmas television. Inspired by its iOS outings, Super Monkey Ball: Banana Splitz includes the option to control your chimp chariot using tilt controls. The implementation works fine, but is a little too imprecise for our tastes. It's on the PlayStation Vita's swift but nimble analogue sticks, then, that Banana Blitz feels most comfortable. Levels are made up of faithfully short sprints to the goal, with scores of bananas to collect along the way. Hazards punctuate the bizarrely poised airborne mazes, with one wrong move plunging your protagonist to his doom. Visually the game looks unsurprisingly stunning, with the presentation soaked in saturated colours that glow brightly on the PlayStation Vita's sumptuous five inch screen. But while we enjoyed our time with the game, we came away worryingly fulfilled. Super Monkey Ball's never lost the playability of its predecessors, but it has lost some of its charm. The game is functionally fine but ultimately a bit unambitious. Perhaps our scepticism can be attributed to the limited nature of our demo, with the game's fancy level editor — which promises to let you create custom levels based on photographs snapped with the PS Vita's cameras — worryingly missing in action. Popular mini-games such as Monkey Target were also absent from our hands-on. Regardless, we can't shake the feeling that as dependable as Super Monkey Ball may be, there are more appealing releases in the PS Vita's launch window, leaving this banana split less tantalising than it probably should be. Super Monkey Ball: Banana Splitz is set to release February 22nd on PlayStation Vita.